Praise outstanding work and keep in contact with families by letting them know of your students progress in class. Send home a WOW! What an Outstanding Week!... family communication form and reward students with EXTRA CREDIT POINTS for bringing back the slip signed. 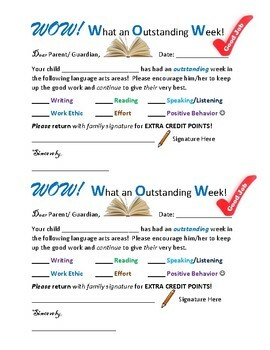 An easy way to communicate with parents/guardians and a great incentive for students who are responsible!